Exactly where and how we developed our present ‘love affair’ with French Country Style Interiors is difficult to say though the ‘invasion’ of the French countryside in the last 50 years – particularly its farmhouses – by well-off English people seeking a comfortable second or retirement home has played its part. Another style trend known as Shabby Chic* – invented by designer Rachel Ashwell in 1989, an English woman born and bred in England and resident in California – continues to appeal to the recent informality in living style adopted by many families in Britain and the USA today. Please refer to to Wikipedia’s definition of Shabby Chic* – now a generic term - at the bottom of the page. French Country Furniture fits into this style very well. 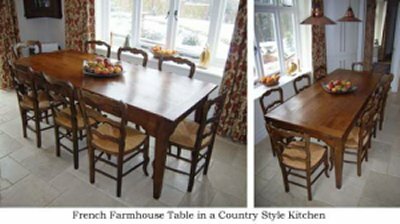 Many people like to mix-and-match these days rather than keep to the ‘purity’ of the original style; so antique oak chairs from Britain may be added to those from a French farmhouse to complete a ‘set’ for the farmhouse kitchen. Finding French Country Furniture or French Country Farmhouse Tables is not quite as easy as it sounds. Here are a few tips. Don’t just rely on the ubiquitous Google when searching on the Internet. MSN and Yahoo appear to update some records of websites more quickly at the moment. And, importantly seem to show new websites earlier. Use French terms alongside the English to winkle out the pieces you want e.g. A bedside table is a chevet in French. Key into your search engine ‘chevet or chevet bedside table’. If you use just English terms you will get in addition English made furniture. If French terms only you’ll probably get France-based suppliers with the accompanying hassle. Many buyers still like to feel and view pieces before buying. Use a supplier without High Street overheads. Find a specialist buyer/renovator to undertake searches for you in France – like Wildwood Antiques. When you’ve bought that splendid farmhouse table you don’t want the cost and inconvenience of finding ‘cheap’ make-do’s whilst you hunt for chairs, sideboard or dresser. ARMOIRE: a wardrobe or cupboard, normally with two or more doors, with shelves or hooks. It was originally used for storing arms pre 17th century. BONNETIÈRE: a narrow wardrobe or cupboard with a single door originally used for ladies bonnets. BUFFET: a sideboard, normally with two doors and often with a drawer or drawers above. BUFFET A DEUX CORPS: a two-tiered buffet with the top half shallower than the bottom. The top cabinet may have either wood or glass panels. CANAPÉ: a sofa or settee. CHEVET: a bedside table or headboard. COFFRE: a coffer or wooden chest. ENFILADE: A long buffet with three or four doors, an interior shelf and generally with drawers. HOMME DEBOUT: “standing man”. A bonnetiere generally for mens clothing and haberdashery with two doors separated by a central drawer. A false drawer was said to have been originally incorporated so a person – a man standing – could hide inside without detection. LIT: a bed. A lit coin was a bed made to fit into a corner and was consequently only decorated on the outer face. SETTEE: An upholstered seat with back and arm rests. SIÈGE: a bench or seat. TABLE AVEC 2, 3, or 4 TIROIRS. A side serving table similar to an English Dresser base. VAISSELIER: A dresser. Often a rack of open shelves with railings above a buffet base. * SHABBY CHIC: Design style using deliberately worn and deteriorated items to achieve an elegant overall effect. It is particularly popular in interior design where furniture and furnishings are either chosen for their age and signs of wear and tear or new items are distressed to look old.